Dawn is one of the top selling Pakistani English newspaper. Dawn newspaper was founded by Quaid-e-Azam Mohammad Ali Jinnah in 1941 . The Dawn newspaper is published in English language and owned by Dawn Group, the news media company. News International is a leading English language newspaper in Pakistan. The News International news paper owned by Jang Group. Daily Times is one of the most popular English language newspaper of Pakistan based in Lahore. Pakistan Observer is a daily English-language newspaper published in Islamabad, Pakistan. The newspaper published from six major cities in Pakistan. Statesman as daily newspaper published in Peshawar, Pakistan. Statesman is The Largest Circulated Newspaper of the region. Business Recorder is one of the most popular business and financial daily epaper in Pakistan. The newspaper contains articles about business, stock market, cotton and textile, fuel and energy, communication, money and banking, taxation and IT related news. Daily Mail International is another English language daily newspaper of Pakistan based in Islamabad. Financial daily is another most widely read business newspapers in Pakistan. This newspaper also publishes Weekly Stock Review and monthly Mutual Fund magazines from Pakistan. The Friday Times is a Lahore based Pakistani weekly English News magazine. The Friday Times was founded in 1989. Nation is another daily English newspaper of Pakistan published from Lahore. The Nation newspaper owned by Nawa-e-Waqt Group of news papers. The Regional Times of Sindh is a daily regional English newspaper of Pakistan. The Regional Times of Sindh published from Hyderabad and Karachi. Pakistan Times is another one of the most popular Pakistani news sites. Pak News is a Premium news source from Pakistan covering the chapters of politics, business, entertainment, sports, jobs, and world news. One of the most widely circulated Urdu newspapers in Pakistan. Daily Express published from Faisalabad, Islamabad, Karachi, Lahore, Multan, Rawalpindi, Peshawar, Quetta, Sargodha, Rahimyar Khan, Gujranwala, and Sukkar. One of the most widely read Urdu-language newspapers. Daily Jasarat Urdu newspaper contains latest news, articles about weather, business, sports, politics, special reports, and more. Dawn Urdu daily newspaper is the Urdu edition of Dawn news. Dawn Urdu is yet another beg new network of Pakistan. Daily Aaj Urdu newspaper published from Peshawar, Islamabad and Abbottabad. Daily Aaj Kal Urdu newspaper printed from Lahore, Karachi and Rawalpindi. Daily Ausaf Urdu newspaper published from Islamabad, Lahore, Multan, Muzaffarabad, Frankfurt and London. 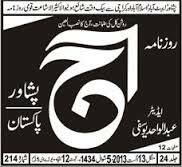 Daily Khabrain Urdu newspaper based in Lahore, Punjab founded in 1992. Daily Lahore Post Urdu newspaper based in Lahore, Pakistan. Lahore Post is a another leading news paper of Punjab. Daily Nawaiwaqt Urdu newspaper is one of the largest circulating Urdu newspapers in Pakistan. Daily Ummat Urdu newspaper published from Karachi, Pakistan. Wahdat is one of most popular Pashto daily newspaper of Pakistan published from Peshawar. It is your good effort khan shab. I really appreciate this site. Khan shab I want to know that can I download newspapers in my mobile in pdf formate from your site. Plz tell me. Men ne dahaka dobty dehka.ye book mily he?? Thanks for giving all the newspaper links here. it is very useful for all. easy to find any news.Thankyou so much for giving such a useful posts. keep it up.